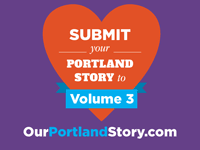 Our Portland Story is a community story project based in Portland, Oregon. 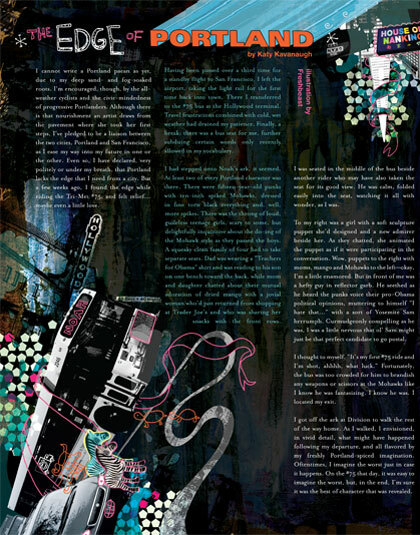 Founded in 2008, it has published two books featuring hundreds of local authors and designers. I wake up every day, and the first thing I do is gaze out of my window to see what the sky has in store for me. In that moment I am reminded, once again, of how lucky I am to live in downtown Portland, Oregon. I love how the water tower and "Made in Oregon" sign shimmer in the distance, protecting the city from the east. Every day I see both icons as they were the day before, yet everyday what changes is the beautiful sky. Not only does the sky change daily, but the sign itself has changed twice, starting out as "White Satin," for the White Satin Sugar Company, then becoming "White Stag" in 1957. 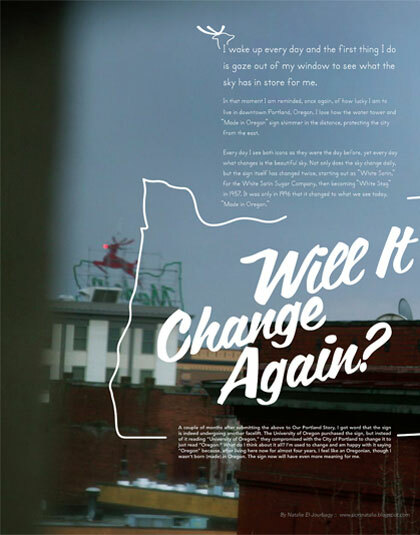 It was only in 1996 that it changed to what we see today, "Made in Oregon." Will it change again? *A couple of months after submitting the above to Our Portland Story, I got word that the sign is indeed undergoing another facelift. The University of Oregon purchased the sign, but instead of it reading "University of Oregon," they compromised with the City of Portland to change it to just read "Oregon." What do I think about it all? I’m used to change and am happy with it saying "Oregon" because, after living here now for almost four years, I feel like an Oregonian, though I wasn’t born (made) in Oregon. The sign now will have even more meaning for me. I am a native of Portland, OR. I have lived in other places in the United States, but Portland brings me back to the place of my 1939 birth, chosen by my emigrating ancestors who passed their love for the area onto their children. As I look back upon my childhood, I think of what I miss, centering around family, food, music, exercise. These themes are still in my life today, but I would now add art. I didn't think, when I was younger, about how much my parents worked at giving us a great foundation for our future lives. We weren't rich, but my parents knew how to enrich our lives with things to see and do. ...going to Jantzen Beach for swimming lessons with Tye Steinbach as as the instructor in the summer. ...occasional visits to the Tik Tok drive-in on Sandy Blvd, where the servers delivered the food to your car and wore roller skates. ...going to Yaw's Restaurant, in the Hollywood District, for hamburgers and shakes. ...Saturday afternoon movies at the theater on Alberta Street. ...Raven Dairy where I would go with my grandmother so she could have fresh buttermilk and I could watch the donut machine. ...walking over the squares of glass in the sidewalks downtown. ...the Vernon Ice Cream store, in NE Portland, for the best ice cream. ...roller skating at Oaks Park and at another rink above Union Avenue, down near the Morrison Bridge. ...taking the downtown trolley to the library. ...boating with our parents on the Columbia River. ...watching the shoemaker making wooden shoes near the Multnomah Hotel on my way to a cello lesson. 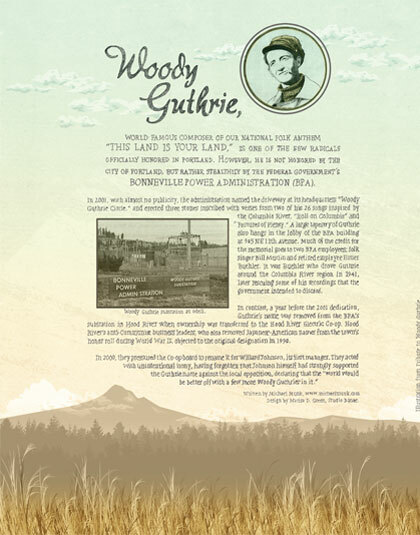 Woody Guthrie, world-famous composer of our national folk anthem “This Land Is Your Land,” is one of the few radicals officially honored in Portland. However, he is not honored by the City of Portland, but rather stealthily by the federal government’s Bonneville Power Administration (BPA). In 2001, with almost no publicity, the administration named the driveway at its headquarters “Woody Guthrie Circle,” and erected three stones inscribed with verses from two of his 26 songs inspired by the Columbia River, "Roll on Columbia" and Pastures of Plenty.” A large tapestry of Guthrie also hangs in the lobby of the BPA building at 905 NE 11th Avenue. Much of the credit for the memorial goes to two BPA employees: folk singer Bill Murlin and retired employee Elmer Buehler. It was Buehler who drove Guthrie around the Columbia River region in 1941, later rescuing some of his recordings that the government intended to discard. In contrast, a year before the 2001 dedication, Guthrie’s name was removed from the BPA’s substation in Hood River when ownership was transferred to the Hood River Electric Co-op. Hood River’s anti-Communist business leaders, who also removed Japanese-American names from the town’s honor roll during World War II, objected to the original designation in 1990. 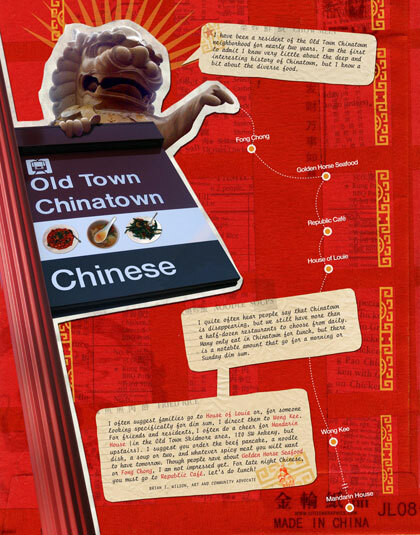 I have been a resident of the Old Town Chinatown neighborhood for nearly two years. I am the first to admit I know very little about the deep and interesting history of Chinatown, but I know a bit about the diverse food. I quite often hear people say that Chinatown is disappearing, but we still have more than a half-dozen restaurants to choose from daily. Many only eat in Chinatown for lunch, but there is a notable amount that go for a morning or Sunday dim sum. I often suggest families go to House of Louie or, for someone looking specifically for dim sum, I direct them to Wong Kee. For friends and residents, I often do a cheer for Mandarin House (in the Old Town Skidmore area, 120 SW Ankeny, but upstairs). I suggest you order the beef pancake, a noodle dish, a soup or two, and whatever spicy meal you will want to have tomorrow. Though people rave about Golden Horse Seafood or Fong Chong, I am not impressed yet. For late night Chinese, you must go to Republic Café. Let's do lunch! 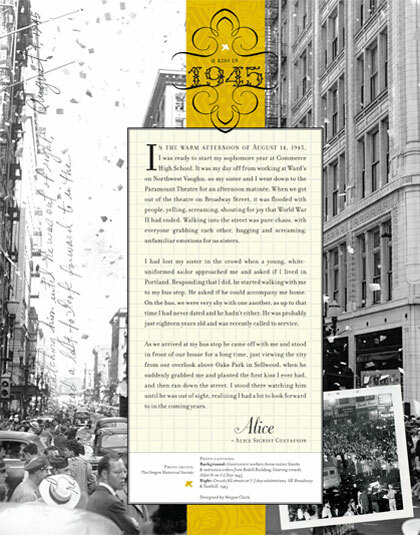 In the warm afternoon of August 14, 1945, I was ready to start my sophomore year at Commerce High School. It was my day off from working at Ward's on Northwest Vaughn, so my sister and I went down to the Paramount Theatre for an afternoon matinee. When we got out of the theatre on Broadway Street, it was flooded with people, yelling, screaming, shouting for joy that World War II had ended. Walking into the street was pure chaos, with everyone grabbing each other, hugging and screaming, unfamiliar emotions for us sisters. I had lost my sister in the crowd when a young, white-uniformed sailor approached me and asked if I lived in Portland. Responding that I did, he started walking with me to my bus stop. He asked if he could accompany me home. On the bus, we were very shy with one another, as up to that time I had never dated and he hadn't either. He was probably just eighteen years old and was recently called to service. As we arrived at my bus stop he came off with me and stood in front of our house for a long time, just viewing the city from our overlook above Oaks Park in Sellwood, when he suddenly grabbed me and planted the first kiss I ever had, and then ran down the street. I stood there watching him until he was out of sight, realizing I had a lot to look forward to in the coming years. Background: Government workers throw ration blanks & restrictive orders from Bedell Building, littering crowds. Alder St on V-J Day 1945. Right: Crowds fill streets at V-J day celebrations. SW Broadway & Yamhill. 1945. I cannot write a Portland paean as yet, due to my deep sand- and fog-soaked roots. I’m encouraged, though, by the all-weather cyclists and the civic-mindedness of progressive Portlanders. Although there is that nourishment an artist draws from the pavement where she took her first steps, I've pledged to be a liaison between the two cities, Portland and San Francisco, as I ease my way into my future in one or the other. Even so, I have declared, very politely or under my breath, that Portland lacks the edge that I need from a city. But a few weeks ago, I found the edge while riding the Tri-Met #75, and felt relief...maybe even a little love. Having been passed over a third time for a standby flight to San Francisco, I left the airport, taking the light rail for the first time back into town. There I transferred to the #75 bus at the Hollywood terminal. Travel frustrations combined with cold, wet weather had drained my patience. Finally, a break: there was a bus seat for me, further subduing certain words only recently allowed in my vocabulary. I had stepped onto Noah's ark, it seemed. At least two of every Portland character was there. There were fifteen-year-old punks with ten-inch spiked Mohawks, dressed in fine torn black everything and, well, more spikes. There was the throng of loud, guileless teenage girls, scary to some, but delightfully inquisitive about the do-ing of the Mohawk style as they passed the boys. A squeaky clean family of four had to take separate seats. Dad was wearing a “Teachers for Obama” shirt and was reading to his son on one bench toward the back, while mom and daughter chatted about their mutual adoration of dried mango with a jovial woman who'd just returned from shopping at Trader Joe's and who was sharing her snacks with the front rows. I was seated in the middle of the bus beside another rider who may have also taken the seat for its good view. He was calm, folded easily into the seat, watching it all with wonder, as I was. To my right was a girl with a soft sculpture puppet she'd designed and a new admirer beside her. As they chatted, she animated the puppet as if it were participating in the conversation. 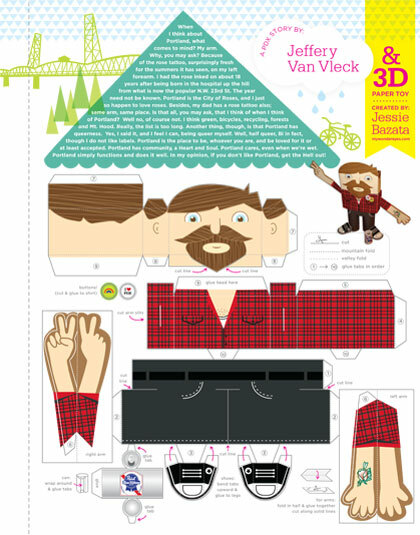 Wow, puppets to the right with moms, mango and Mohawks to the left—okay, I’m a little enamored. But in front of me was a hefty guy in reflector garb. He seethed as he heard the punks voice their pro-Obama political opinions, muttering to himself "I hate that..." with a sort of Yosemite Sam hrrrumph. Curmudgeonly compelling as he was, I was a little nervous that ol’ Sam might just be that perfect candidate to go postal. I thought to myself, “It’s my first #75 ride and I’m shot, ahhhh, what luck.” Fortunately, the bus was too crowded for him to brandish any weapons or scissors at the Mohawks like I know he was fantasizing. I know he was. I located my exit. I got off the ark at Division to walk the rest of the way home. As I walked, I envisioned, in vivid detail, what might have happened following my departure, and all flavored by my freshly Portland-spiced imagination. Oftentimes, I imagine the worst just in case it happens. On the #75 that day, it was easy to imagine the worst, but, in the end, I'm sure it was the best of character that was revealed. 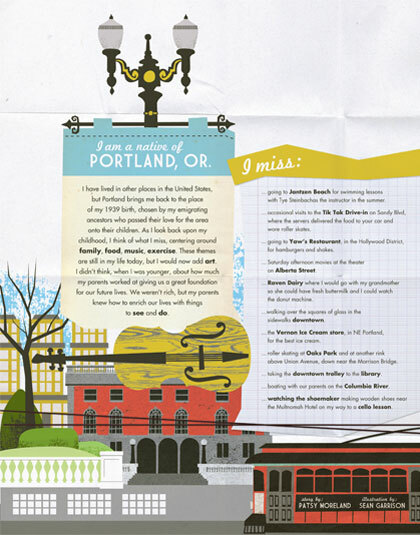 When I think about Portland, what comes to mind? My arm. Why, you may ask? Because of the rose tattoo, surprisingly fresh for the summers it has seen, on my left forearm. I had the rose inked on about 18 years after being born in the hospital up the hill from what is now the popular N.W. 23rd St. The year need not be known. Portland is the City of Roses, and I just so happen to love roses. Besides, my dad has a rose tattoo also; same arm, same place. Is that all, you may ask, that I think of when I think of Portland? Well no, of course not. I think green, bicycles, recycling, forests and Mt. Hood. Really, the list is too long. Another thing, though, is that Portland has queerness. Yes, I said it, and I feel I can, being queer myself. Well, half queer, Bi in fact, though I do not like labels. Portland is the place to be, whoever you are, and be loved for it or at least accepted. Portland has community, a Heart and Soul. Portland cares, even when we're wet. Portland simply functions and does it well. In my opinion, if you don't like Portland, get the Hell out! 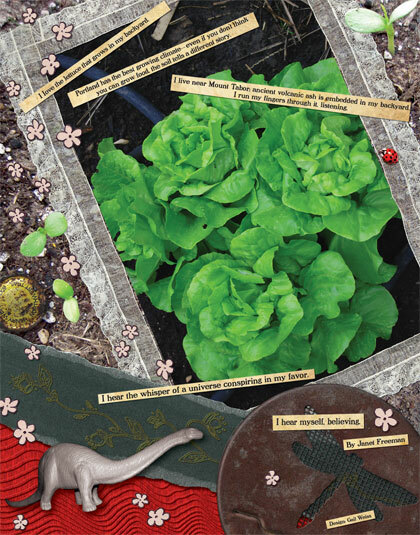 I Iove the lettuce that grows in my backyard. Portland has the best growing climate--even if you don't think you can grow food, the soil tells a different story. I live near Mount Tabor; ancient volcanic ash is embedded in my backyard. I run my fingers through it, listening. I hear the whisper of a universe conspiring in my favor. 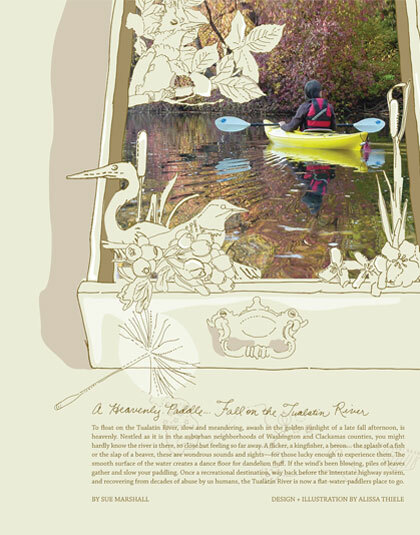 To float on the Tualatin River, slow and meandering, awash in the golden sunlight of a late fall afternoon, is heavenly. Nestled as it is in the suburban neighborhoods of Washington and Clackamas counties, you might hardly know the river is there, so close but feeling so far away. A flicker, a kingfisher, a heron…the splash of a fish or the slap of a beaver, these are wondrous sounds and sights--for those lucky enough to experience them. The smooth surface of the water creates a dance floor for dandelion fluff. If the wind’s been blowing, piles of leaves gather and slow your paddling. Once a recreational destination, way back before the interstate highway system, and recovering from decades of abuse by us humans, the Tualatin River is now a flat-water-paddlers place to go. 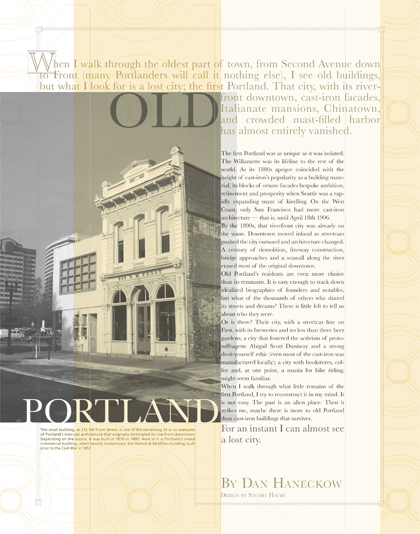 When I walk through the oldest part of town, from Second Avenue down to Front (most Portlanders will call it nothing else), I see old buildings, but what I look for is a lost city; the first Portland. That city, with its riverfront downtown, cast-iron facades, Italianate mansions, Chinatown, and crowded mast-filled harbor has almost entirely vanished. The first Portland was as unique as it was isolated. The Willamette was its lifeline to the rest of the world. As its 1880s apogee coincided with the height of cast-iron’s popularity as a building material, its blocks of ornate facades bespoke ambition, refinement and prosperity when Seattle was a rapidly expanding maze of kindling. On the West Coast, only San Francisco had more cast-iron architecture--that is, until April 18th 1906. By the 1890s, that riverfront city was already on the wane. Downtown moved inland as streetcars pushed the city outward and architecture changed. A century of demolition, freeway construction, bridge approaches and a seawall along the river erased most of the original downtown. Old Portland’s residents are even more elusive than its remnants. It is easy enough to track down idealized biographies of founders and notables, but what of the thousands of others who shared its streets and dreams? There is little left to tell us about who they were. Or is there? Their city, with a streetcar line on First, with its breweries and no less than three beer gardens; a city that fostered the activism of proto-suffragette Abigail Scott Duniway and a strong do-it-yourself ethic (even most of the cast-iron was manufactured locally); a city with bookstores, coffee and, at one point, a mania for bike riding, might seem familiar. When I walk through what little remains of the first Portland, I try to reconstruct it in my mind. It is not easy. The past is an alien place. Then it strikes me, maybe there is more to old Portland than cast-iron buildings that survives. For an instant I can almost see a lost city. Caption: This small building, at 233 SW Front Street, is one of the remaining 20 or so examples of Portland's iron-cast architecture that originally dominated its riverfront downtown. Depending on the source, it was built in 1870 or 1885. Next to it is Portland's oldest commercial building, albeit heavily modernized, the Hallock & McMillan building, built prior to the Civil War in 1857. Connect with us on Facebook,Twitter, or Flickr. Sign up for our e-newsletter.